The Samsung Galaxy Mega 6.3 stands 167.6mm tall and 88mm wide. That's about 20% more surface area than the Note II (151.1 x 80.5mm), and you do get just over 30% more screen real estate. This means Samsung has managed to cover a bigger portion of the front of the device with the screen. Also, the Mega 6.3 is thinner (8mm vs. 9.4mm) and not much heavier (199g vs. 183g) than the Note II. The Samsung Galaxy Mega 6.3 follows the Galaxy S4 design language to a tee, just like the Note 8.0. It is a sort of a facelift of the Galaxy S III design, less rounded with slimmer bezel and a characteristic LED flash positioning under the back camera. Another thing Samsung changed between the S III and S4 was the pattern of the plastic. We like the new one better, but the glossy hyperglazed plastic is still quite impractical - easily smudged and with poor grip. Other than that, the general styling spans devices with screens from 3.27" (Galaxy Young) to 8" (Galaxy Note 8.0) and frankly it's worn out and lacking in premium feel. The screen on the Samsung Galaxy Mega 6.3 is bigger than most phones (including the Galaxy S4). It's so big it barely fits on the device - the bezels are very thin, especially on the side. The Galaxy Mega 6.3 screen offers just over 30% more real estate than the Note II and nearly 60% more than the 5" Galaxy S4. It makes very efficient use of the front surface, rivaled only by the S4 itself and the Sony Xperia ZL. You can hold the phablet in one hand, though some will find it uncomfortable. The thin bezels offer no room to put your thumb and the slippery back doesn't help. 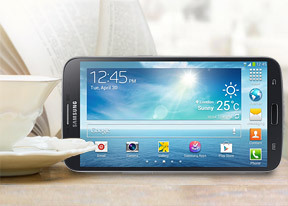 Using the Samsung Galaxy Mega 6.3 with one hand is only possible for a limited number of tasks. Samsung has enabled a smaller keyboard in some places (the QWERTY keyboard, the dialer keyboard), which does improve usability a bit. However, the notification area is completely out of reach and the lower corners are tough too, both areas are very important to working with Android. You can pocket the Mega 6.3 and since it's slim and fairly light it won't bulge in your pocket or feel like a brick.